On Sunday, 27 May, Bishop Michael graciously took time from his busy schedule surrounding the Saint Tikhon's Monastery Pilgrimage to visit Saint Andrew Parish (Dix Hills NY) and its faithful as they celebrated the 25th anniversary of Father John Klingel's ordination to the Holy Priesthood. 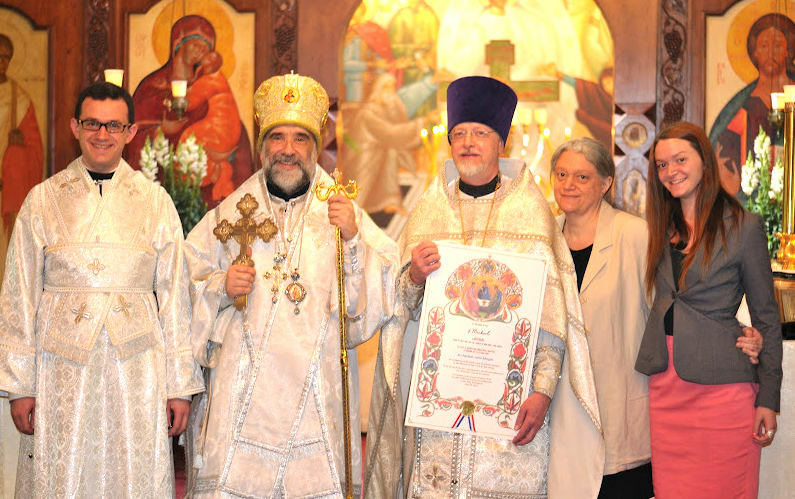 At the Hierarchical Divine Liturgy, Bishop Michael formally awarded the jeweled cross -- a loving gift from several parishioners -- as well as the award of wearing the palitza to Father John. His Grace also tonsured faithful altar server and singer Chris Whitehorn to the rank of Reader. In presenting a gramota (citation) from the Holy Synod of Bishops thanking Father John for his dedicated service over the last 25 years, Bishop Michael commented on the life of the Holy Apostle Paul who supported his ministry through a career of tent-making. The lives of such “tentmaker”' priests, His Grace noted, are marked by their own unique difficulties and sacrifices. Father John has taken the dual challenge of ministering to his parishioners while also laboring in the world to support his family and ease the financial burden of his parish; he and his family frequently have to "do without," offering their family life in devotion and service to our Lord. Following the joyful service, a celebratory reception was held at a nearby restaurant. Father John offered words of thanks to the parish and his family. Parish Council President, Mark Guyer, presented a slideshow of photos from Father John's twenty-five years of ministry. The parish is particularly grateful to His Grace for his pastoral visitation and encouragement, and also to Deacon John Diamantis and his wife, Andrea, of Holy Trinity Church (East Meadow NY) for joining in the festivities.